Like many other titles in the history of literature, Brendan Kennelly: Behind the Smile has been censored in Ireland. The Phoenix was the first and the only Irish media to cover the issue and denounce another instance of censorship in the Republic of Ireland. The following piece was published in The Phoenix on June 28, 2013. 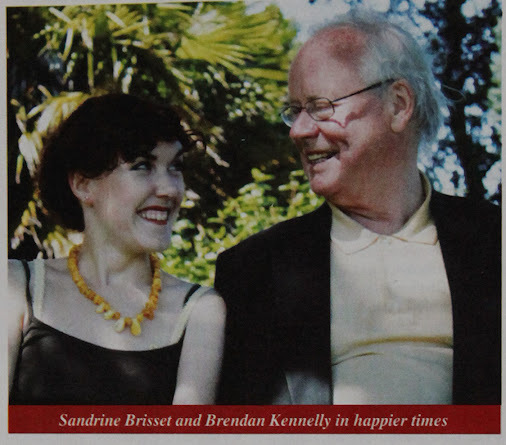 What a hornet's nest Trinity College academic Sandrine Brisset has stirred up with her book on poet Brendan Kennelly. The French Adjunct lecturer at TCD's School of Law (she is originally from Brittany) has been working in the university for eight years but her book has been withdrawn from sale by the college. What is significant about this – and the removal of Brendan Kennelly - Behind the Smile from other outlets - is that there have been no legal threats whatsoever. A quiet word from friends of the ageing poet has been sufficient to invoke the censorship. For a university to ban a serious work by one of its employees is a serious matter. The fact that the book has been withdrawn from the TCD library bookshop on the grounds that the college's retired Professor of Modern Literature, Brendan Kennelly, is "uncomfortable" with some of the contents is gobsmacking. Sandrine Brisset has known Kennelly for ten years and developed a close relationship with him to the extent that he co-operated with her in this authorised publication. She has referred to a letter from the poet stating that Brisset "knows me better than I know myself'. Significantly, however, there has been no suggestion to date that anything in the book is factually wrong or libellous. But Brisset has been the subject of some extreme comment on Facebook. Brisset's book was withdrawn from sale in theTrinity College library bookshop at the start of May. This followed an approach on behalf of Brendan Kennelly, who had complained the book contained material with which he was "uncomfortable". Although at no stage was there any legal correspondence, the college's legal eagle Sinead Mac Bride advised that the title should be removed from sale. When this was queried by Brisset, she was informed that the college was "on notice of Professor Kennelly's feeling on the matter" and it was also pointed out that TCD was "under no obligation, legal or otherwise", to stock the book. When Goldhawk enquired the exact reason why Brisset's book had been withdrawn from sale in the college, he was informed by a spokesperson that "books are displayed and sold in the shop subject to demand and the sale of books is frequently discontinued after a short period of time ... There wasn't a huge demand for the book." Meanwhile, just across the road from TCD, bookseller Hodges Figgis on Dawson Street also followed suit and the title was swiftly withdrawn, although last week it was still available in the nearby Dubray Books on Grafton Street (and can be ordered from www.raglanbooks.ie). An invitation to carry out a reading at the start of this month during Listowel Writers Week at the Kerry Literary and Cultural Centre was also withdrawn, again in the absence of a legal threat. Brisset was informed that members of the Kennelly family were "not happy with some contents of the publication" and that the centre had been "unaware of the sensitivities of members of the family surrounding the publication".